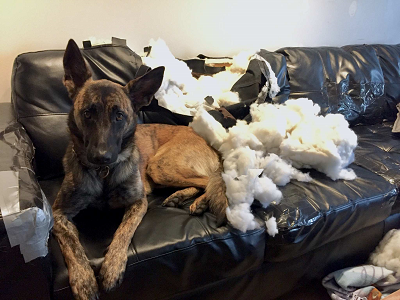 Tell us about yourself: Hilde is a rescue that we suspect is at least partially Dutch Shepherd. I've been working with Hilde in agility classes for a while now, but we finally had our first trial a few weeks ago. It was a bit of a challenge at first ("Dad, why are we doing this in the morning rather than at night?" "What are all these strange people and dogs doing here?" "Who is that guy on the course?" "There are some unusual noises from that guy with the big camera over there!"). Luckily it was a very relaxed and lenient atmosphere (ASCA). Big smile over the last jump! Very nice!!!! I also do agility with my Dutch, ICE. It is a fun activity for building teamwork. Enjoy!!! So glad you both are enjoying it! Love the second pic.